You've probably never seen another movie quite like The Kid Stays in the Picture, but, trust me, novelty value isn't the only thing it's got going for it. Equal parts illustrated history, cautionary fable, kiss-and-tell memoir and star-studded extravaganza, this uniquely fascinating and robustly entertaining documentary is a raffish, rollicking masterpiece of first-person myth-making. Robert Evans is the center of attention here, even though – except for a fleeting, near-subliminal glimpse – he doesn't allow himself to be recorded by the cameras of documentarians Brett Morgan and Nanette Burstein. All we see is an artfully shrewd montage of archival photographs, interview clips, stock footage – and excerpts from a couple of '50s movies that aptly illustrate Evans' self-appraisal: "I was a half-assed actor." That's right: We don't see today's Robert Evans, but we certainly hear him. It's the same voice that launched several thousand audio books when Evans recorded The Kid Stays in the Picture, his well-regarded warts-and-all 1994 autobiography. It's a gravelly baritone that seems to synthesize hard-won wisdom and hung-over pugnacity. And when Evans speaks here, we can't help listening, because his insights and anecdotes are so fabulously engrossing. The word "fabulous," by the way, is not idly chosen. As in his book, Evans warns his audience early on: "There are three sides to every story: Yours, mine and the truth. And no one is lying." The Kid Stays in the Picture is entirely Evans' side of the story. There are no talking-head interviews with friends or foes, no competing narrator to cast doubts or raise questions. Morgan and Burstein obviously have shaped the material to their own overall design, editing or eliminating certain items for brevity and narrative momentum. (We learn a lot about Evans' marriage to Love Story star Ali MacGraw, and almost nothing about his several other wives.) But this is Evans' show – his career, his life -- and the filmmakers are smart enough to let him do all of the talking. Evans presents himself as being in the right place at the right time, time and again. He lucked into business success, then lucked into an acting career. And after his acting career tanked – he was "a half-assed actor," remember? – he lucked into a new career as a producer. After that, he lucked into the job of production chief at Paramount Pictures in the late 1960s. All this talk of luck, of course, recalls another memorable Evans quote: "Luck is when opportunity meets preparation." Maybe he wasn't fully prepared when he first landed the Paramount job, but Evans learned quickly, worked passionately and gambled frequently. To his credit, many of those gambles – Paramount released The Odd Couple, Rosemary's Baby, Harold and Maude, Chinatown and a couple of Godfather epics during his watch – paid off as critical and commercial hits. 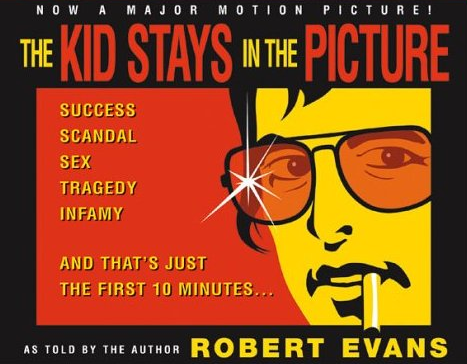 Indeed, The Kid Stays in the Picture can be viewed a persuasive argument that, during the 1970s, a period many view as the last golden age for Hollywood cinema, Evans was among the most significant shapers of American pop culture. The movie is most delicious when Evans dishes about the making of classic movies with Jack Nicholson, Al Pacino, Mia Farrow, Dustin Hoffman and other notables. (He says he drove Roman Polanski to direct faster while making Rosemary's Baby, and ordered Francis Coppola to bring him a longer, more satisfying cut of The Godfather.) But Kid is every bit as interesting, even compelling, as Evans describes his own role in his post-Paramount downfall. Evans is amazingly frank when discussing his self-destructive behavior, and totally unapologetic about the myriad excesses – including substance abuse and prodigious womanizing – that are part of his living legend. His bluntness often sounds comical, like a bad imitation of tough talk in a hardboiled novel. (It's not love at first sight when he lunches with Ali MacGraw, but he tells her: "Remember, if it doesn't work out with that other guy, I'm only seven digits away!") And it's hard to ignore that his self-abnegation is threaded with steadfast pride: Even as he tells the worst about himself, Evans always manages to paint himself as a survivor. But, then again, he's entitled: He has survived. love your posts. amazing picture. Really nice post. Great work.